MACOMB, IL – Delta Upsilon will host its 4th annual haunted house and trail from 7-10 p.m. Friday-Saturday, Oct. 19 – 20. 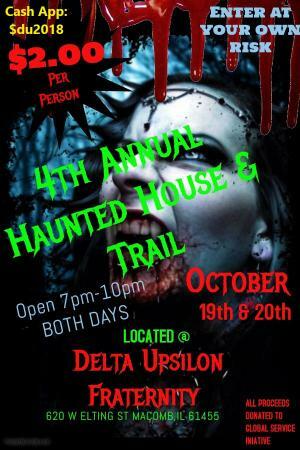 This event is located at the Delta Upsilon Fraternity, at 620 W Elting St. Admission is $2 per person and all proceeds will be donated to the Global Service Initiative.